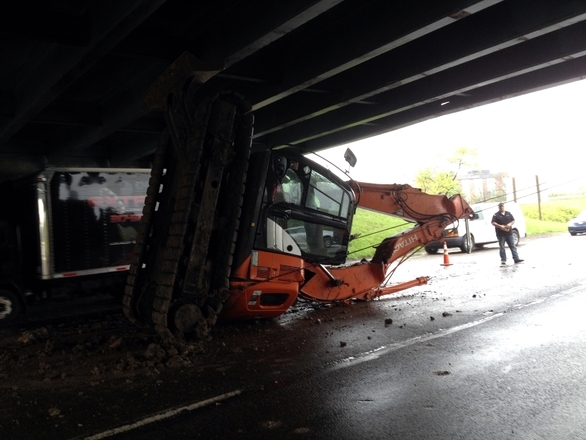 On Thursday, April 28, 2016, a truck hauling an excavator collided with the underside of the I-465 bridge over northbound I-69/Binford Boulevard, damaging a steel beam. Bridge inspectors and engineers took immediate action to ensure that the structure is safe, and INDOT has contracted Rieth-Riley Construction to repair the damage for $348,792. For information about how INDOT seeks reimbursement for repairing and replacing damaged infrastructure, go to http://www.in.gov/indot/3130.htm. INDOT reminds all drivers to follow safety requirements by securing and measuring all loads, obtaining permits for loads higher than 13 feet 6 inches and following designated routes for oversize vehicles. INDOT's interstate messages can be viewed in real time at http://pws.trafficwise.org. Follow INDOT East Central on Facebook and Twitter. Find links to INDOT social media pages at http://www.in.gov/indot/3074.htm.